« Do you know when the Exodus was? German Justice Minister Heiko Maas has revealed details of a new plan to curb hate speech and fake news on social media sites. The ministry is planning a new law that will force social networks to publish a quarterly accountability report, which will include information on the number and qualifications of employees responsible for deleting and blocking content that breaches Germany’s hate speech and slander laws. While the above may seem innocent to many, it reminds me of George Orwell’s book, nineteen eighty-four. 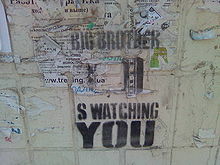 In that book, it mentions that ‘Big Brother,’ meaning the government, was always watching you. In more and more ways now, with modern technology, that is possible. Irrespective of one’s views on headscarves, Europe is moving more and more towards becoming a totalitarian state. (CNN) FBI Director James Comey warned Wednesday that Americans should not have expectations of “absolute privacy,” adding that he planned to finish his term leading the FBI. This is a totalitarian attitude. And in a world where sites that disagree with the ‘politically correct’ are called “fake,” it is very dangerous–as is Germany’s attempts to strong-arm social media companies. Sadly, we are seeing this come to past. And while George Orwell did not write about private companies like Facebook, Twitter, or YouTube, they do not support the agenda or the morality of the Bible and have repeatedly been involved in surveillance and censorship. Europe and China have also been heavily involved in pushing internet monitoring, and sadly have learned some techniques on how to do that from the US government as well as from US companies. As the world uses more digital financial transactions, it is getting easier and easier for the above to be fulfilled. A totalitarian state dominated by Germany will rise up (see also Germany in Biblical Prophecy). Many in and out of the government have plans and are watching the internet with plans to deal with materials that they some day hope to silence. Their views are hauntingly like George Orwell’s book. And while you might think that if you have done nothing wrong, you have nothing to fear from surveillance, consider that many in the government of the USA consider that not supporting homosexual marriages, etc. are extremist. I also saw someone once on a documentary that stated that people who believed in the millennium could not be trusted and should be considered as potential terrorists. The fact that we in the Continuing Church of God would be considered pacifists, does not change the fact that since we hold to millennial and other biblical views that we will not be improperly classified by government employees with various agendas. We are getting closer to this time. More and more are starting to see that their are plans to censor speech from the internet. Philadelphian Christians want to respond to the doors that Christ opens to proclaim the gospel (2 Corinthians 2:12; 1 Corinthians 16:8-9; Colossians 4:2-4). We will stand up for the truth, despite realizing that the ‘famine of the word’ that the prophet Amos referred to is coming. We must do the work and persevere to the end. And yes, we know that there will be massive government persecution (cf. Daniel 7:25; see also Persecutions by Church and State). Furthermore, there is good news as the Kingdom of God will come and replace the Orwellian (Revelation 13:16-18) system that we see being put together today. And have no doubts, the type of Orwellian society that the Bible warned about for the end times is truly taking shape. The German position on social media is simply another step in preparation for that. This entry was posted on Tuesday, March 14th, 2017 at 7:00 am	and is filed under Prophecy.